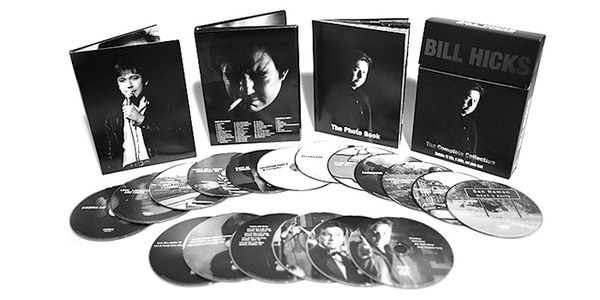 The release of Bill Hicks: The Complete Collection in September represents the absolute final word on the subject of the late comic. The 18 disc set, charmingly boxed up to look like a pack of cigarettes, brings together his standup albums, televised specials, and a wealth of bootleg recordings that provides a comprehensive look at his evolution as a comedian. You can see and hear his confidence grow as his material became more pointed, political and brilliant. While it is surely instructive for fans to tackle this set in chronological order so you can follow the arc of his career from his days at the Comix Annex in Houston, Texas to performing at 1200 capacity theaters in the U.K., for the newbie, you might give up after watching his nervous, youthful set filmed in 1981. With that in mind, we offer up our ranking of the 18 discs found in this collection, from the best to the worst, as a way for you fresh fans to dive into this trove of audio and visual comedy. All the better to appreciate just how good Hicks could be and then flesh out the story with the rest. The Kessler will bring Phyllis Diller, Bill Hicks and Andy Kaufman back to the stage this Halloween by having their souls inhabit the bodies of comedians Saffron Herndon, Clint Werth and Dan Danzy for their "Homage Nation" comedy show. Stand-up comedians may be alone on a stage in a physical sense, but spiritually speaking, they are never by themselves. They are constantly swarmed by the spirits of the comedians who inspired them. Sometimes it's an unknown name who convinced a club owner to give them five minutes in the spotlight. For most it's a famous great who broke new boundaries with his material or style and pushed them to elevate their material from simple jokes to a well-crafted set. Comedian Clint Werth cites comedy legend Bill Hicks as one such name. "He was the first stand-up comedian I really got into," Werth says. "I grew up not that far from where he did, in super-conservative College Station, where I was pretty sure I was crazy. But then a friend of the family who was going to Texas A&M gave me some Bill Hicks tapes and some Dungeons and Dragons books when I was 12 years old, I guess because he realized I was a weirdo. Anyway, it was the first time I ever heard someone say the things I had always been thinking. It was a bummer to find out that he had died less than a year before I discovered him." The Kessler has a special show on Halloween night designed to let the spirits of these and other legendary comedians come back from the dead and play on a stage again through the living bodies of some of Dallas' best comedians. The Kessler's "Homage Nation" show at 8 p.m. Saturday will feature performances by Werth, Katy Evans, Saffron Herndon, Silas Coursón, Alex Axon, Billy McFarland and Dan Danzy paying homage to comedy greats such as Hicks, Minnie Pearl, Phyllis Diller George Carlin, Janeane Garofalo, Mitch Hedberg and Andy Kaufman, respectively. Comedian Josh Johnson will host the show as himself, presumably so there's no unnecessary confusion.